In ancient Greek cult-practice and literature, a nekyia (Ancient Greek: ἡ νέκυια) is a "rite by which ghosts were called up and questioned about the future," i.e., necromancy. A nekyia is not necessarily the same thing as a katabasis. While they both afford the opportunity to converse with the dead, only a katabasis is the actual, physical journey to the underworld undertaken by several heroes in Greek and Roman myth. In common parlance, however, the term "nekyia" is often used to subsume both types of event, so that by Late Antiquity for example "Olympiodorus ... claimed that three [Platonic] myths were classified as nekyia (an underworld story, as in Homer's Odyssey book 11)". A number of sites in Greece and Italy were dedicated wholly or in part to this practice. "The Underworld communicated with the earth by direct channels. These were caverns whose depths were unplumbed, like that of Heraclea Pontica." The most notable was the Necromanteion in the northwestern Greek town of Ephyra. Other oracles of the dead could be found at Taenaron and Avernus. Such specialized locations, however, were not the only places necromancy was performed. One could also perform the rite at a tomb, for example. Among the gods associated with the nekyia rite are Hades, his wife Persephone, Hecate, and Hermes (in his capacity as psychopompus – one who escorted souls to Hades). The earliest reference to this cult practice comes from Book 11 of the Odyssey, which was called the Nekyia in Classical antiquity. Odysseus was instructed to "make a journey of a very different kind, and find your way to the Halls of Hades ... across the River of Ocean". There he consults the soul of the priest and prophet Teiresias about the means to return home to Ithaca, in a setting of "ghosts and dark blood and eerie noises, like a canvas of Hieronymous Bosch". He sacrifices a ram and an ewe so that "the countless shades of the dead and gone" would "surge around" him and then he meets and talks to the souls of the dead. "The story of Odysseus's journey to Hades ... was followed ... by further accounts of such journeys undertaken by other heroes", although it is clear that, for example, "the κατάβασις [katabasis, "descent"] of Herakles in its traditional form must have differed noticeably from the Nekyia". The Athenian playwright Aeschylus features the use of tombside nekyiai in his Persians and Libation Bearers. Returning from the Underworld, from the House of Hades, alive represents the monumental feat a mere mortal could accomplish. 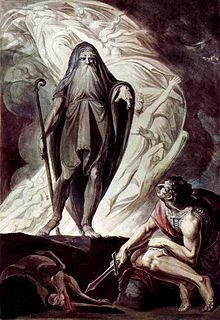 In this, Aeneas surpasses Odysseus who merely journeys to the entrance of the Underworld to perform the ritual sacrifice needed to summon the spirits of the dead, the ghosts whose knowledge he seeks. Aeneas actually descends into the House of Hades and travels through the world of the dead. Lucian of Samosata is the author of a satirical dialogue titled Μένιππος ἢ Νεκυομαντεία, dating from A.D. 161-162, which, as German classical philologist Rudolf Helm (1872-1966) argues, may be an epitome of the lost Nekyia of cynic philosopher Menippus. In The Lives of the Philosophers, Diogenes Laërtius lists the Nekyia among the thirteen works composed by Menippus (Vitae philosophorum, VI, 101). In Lucian's dialogue, Menippus, perplexed by the conflicting accounts of the afterlife put forward by Homer, Hesiod, the philosophers, and the tragic poets, decides to discover the truth for himself. He therefore enlists the help of a Babylonian Magus, named Mithrobarzanes, in order to visit the underworld. Mithrobarzanes performs a necromantic ritual, and the two descend to Hades, where they see Pyriphlegethon, Cerberus, the palace of Pluto, Charon, and the rest of the mythological machinery of the Greek underworld. Ultimately, the underworld setting serves Lucian as a vehicle for satire on not only the rich and powerful, but also the philosophers. C. G. Jung used the concept of Nekyia as an integral part of his analytical psychology: "Nekyia ... introversion of the conscious mind into the deeper layers of the unconscious psyche". For Jung, "the Nekyia is no aimless or destructive fall into the abyss, but a meaningful katabasis ... its object the restoration of the whole man". Jolande Jacobi added that "this 'great Nekyia' ... is interwoven with innumerable lesser Nekyia experiences". Jung used the images of the Nekyia, of "the night journey on the sea ... descend into the belly of the monster (journey to hell)", and of "'Katabasis' (descent into the lower world)" almost interchangeably. His closest followers also saw them as indistinguishable metaphors for "a descent into the dark, hot depths of the unconscious ... a journey to hell and 'death'" – emphasising for example that "the great arc of the night sea journey comprises many lesser rhythms, lesser arcs on the same 'primordial pattern,'" just like the nekyia. The devil image still haunts in our fears of the unconscious and the latent psychosis that supposedly lurks there, and we still turn to methods of Christianism – moralizing, kind feelings, communal sharing, and childlike naivete – as propitiations against our fear, instead of classical descent into it, the nekyia into imagination… (Only) after his nekyia, Freud, like Aeneas (who carried his father on his back), could finally enter "Rome". "Thomas Mann's conception of the nekyia draws extensively from 'the doctrines of the East...Gnosticism, and Hellenism'". Jung considered Picasso's "early Blue Period ... as the symbol of Nekya, a descent into hell and darkness". Wikimedia Commons has media related to Nekyia. ^ 1929-, Morford, Mark P. O., (1999). Classical mythology. Lenardon, Robert J., 1928- (6th ed.). New York: Longman. pp. 394–395. ISBN 0195143388. OCLC 39189848. ^ Lucian und Menipp, Leipzig and Berlin: Teubner, 1906, chapter 1 "Die Nekyomantie", pp. 17-62. ^ Hillman, James (1979). Dream and the Underworld. HarperCollins. pp. 88, 168, 206 01. ISBN 0-06-090682-0. This page was last edited on 25 January 2019, at 09:24 (UTC).